Photo and "Spicy Cauliflower with Sesame Recipe" from Heidi Swanson's 101cookbooks.com, adapted from Reza Mahammad's cookbook "Rice, Spice, and Everything Nice"
I love cauliflower. I also love spicy things. For our one-year dating anniversary, Ryan and I are going to celebrate by making homemade hot sauce. Recently when he and I went out to eat at a North Indian restaurant, we ordered everything “very spicy,” as usual. And as usual, the person taking our order kind of looked at us (particularly Ryan) with widened eyes, which, again, usually means “Yeah, yeah, sure, okay,” and then usually when we get the food it is not very spicy at all. Fortunately (and unusually), however, this kind restaurateur took us at our word. Probably some of the best Indian food I’ve had since coming back from a summer in India, in 2004. 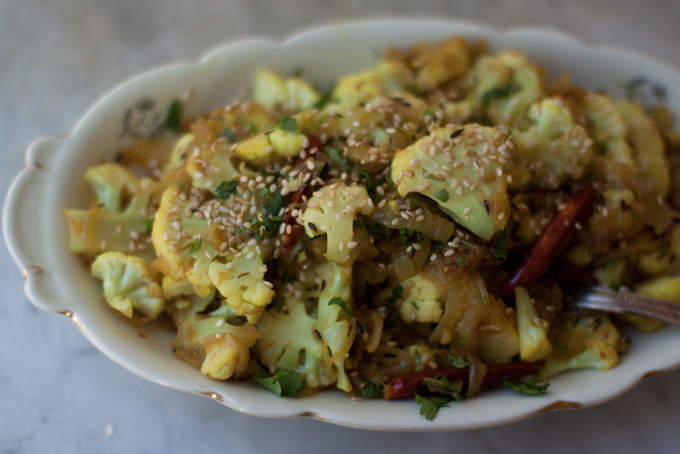 And this recipe is not going to even approach that, but it is cauliflower and it is spicy and it does have ginger and cumin and turmeric and caramelized onions and two kinds of chiles, so I am certainly not complaining. Man, I’ve missed spending real time in the kitchen. I’ve even started generating these weird food metaphors in my head. Yesterday’s fall weather felt heavy and bright, like lemon curd. Time to get back to those pots and pans. I wanna go to that restaurant!! We never get taken seriously when we say spicy. West Sacramento Strip Mall indian food, best I’ve ever had (by a lot). Try the samosas with choley, mint and tamarind sauce, oh man. PS I think we’re going there tonight! PPS But I’m for cooking too! so funny…I’ve seen some of my friends get that you-can’t-handle-that-kind-of-spice look! WoW a summer in India! That must of been an amazing experience Katie. Well this recipe looks amazing…I’m interested in trying it. Thanks & Hugs! O’ & a very Happy 1 Year to you & Ryan!